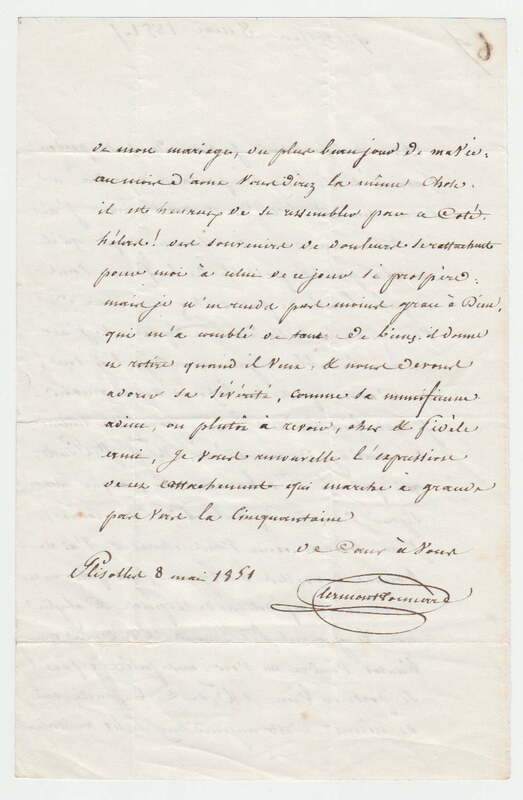 Autograph Letter Signed, discussing recent news, the fortieth anniversary of his marriage, the forthcoming marriage of his niece, and other matters. In French. 2 pp. 8 x 5½ inches, folds, in good clean condition. Glissolles, 8 May 1851. Aimé-Marie-Gaspard, comte de Clermont-Tonnerre (1779-1865), French general and statesman. He fought throughout the Napoleonic Wars and became adjutant to the King of Naples in 1808. He was Minister of the Navy and Colonies in 1820 and Minister of War in 1823. Clermont-Tonnerre sent Hyacinthe de Bougainville on his voyage round the world (1824-26). After the revolution, he refused to swear allegiance to the new government of Louis-Philippe.